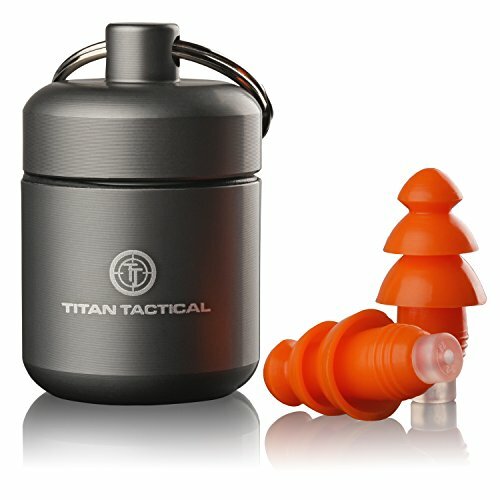 Titan Tactical's 29 NRR are one of the only removable filtered ear plugs available on the market that are designed for shooting. They protect your hearing without interfering with your ability to hear routine sounds or conversations. Their triple flanged-stem design fits most people and provides a Noise Reduction Rating (NRR) of 29dB. Sounds, at safe levels, are allowed to pass through into the ear canal, while potentially harmful noises (above 85dB) are reduced via a proprietary design that incorporates a special easily removable high-impact noise-reducing filter. This high-impact filter in the stem of the ear plug acts like a trampoline for noises that occur with more force than regular sounds, thus making these earplugs an effective hearing protection solution for military, tactical law enforcement, hunters, gun range shooters, event shooting, construction, manufacturing, and maintenance applications. Utilizing state-of-the-art, sound level-dependent hearing protection technology, noises over a damaging threshold are bounced away and the rest of the surrounding sound enters the ear plug and is funneled through to your ear drum. This preserves the clarity of the sound that you're hearing and allows you to hear warning sounds and conversation without having to remove the ear plugs. Communicating at normal levels and maintaining auditory environmental awareness can be challenging when using conventional hearing protection in quiet and low levels of noise. Titan Tactical Aluminum Storage Case.